The law of contract is ripe for feminist analysis. Despite increasing calls for the re-conceptualisation of neo-classical ways of thinking, feminist perspectives on contract tend to be marginalised in mainstream textbooks. 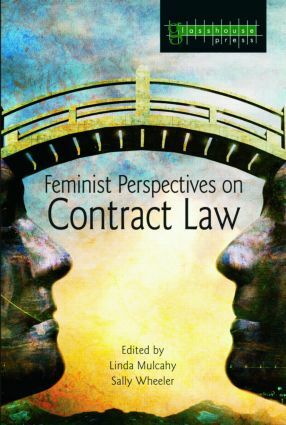 This edited collection questions the assumptions made in such works and the ideologies that underpin them, drawing attention to the ways in which the law of contract has facilitated the virtual exclusion of women, the feminine and the private sphere from legal discourse. Contributors to this volume offer a range of ways of thinking about the subject and cover topics such as the feminine offeree, feminist perspectives on contracts in cyberspace, the forgotten world of women and contracts, restitution and feminist economic theory, the gendered power dynamics of undue influence, and the feminisation of dispute resolution.